Real Deal Texas Roots and Blues! Kathy Murray is the Willie Dixon of this generation of blues songwriters. 15 stellar original tracks. These songs are all at least partly autobiographical. “I Want To” is about the fear of being hurt, while still sustaining a flame deep inside that “wants to” love. “Call Me Mrs. Blues” was born of grief and the feeling of being “married to the blues”. “Your Barn Door’s Open” was recorded by the fabulous Kate Meehan in Australia. Kate laughed until she cried when she found out that in American slang the title means “Hey Mister, you might want to check your zipper!” “Loveaholic” totally came to life when Dylan Cavaliere gave it his triple-slap rockabilly bass groove. “Each Kiss” and “Exception to the Rule” (check out Ben Buck’s cool beat boxing on this one!) are among many songs inspired by my musical compadre and love of my life, Bill Jones. 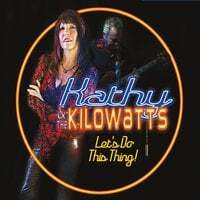 Contemporaries of every hallowed name in Austin's Seventies/Eighties blues boom, Kathy & the Kilowatts understand the form's vocabulary as well as any surviving practitioners. "Call Me Mrs. Blues" and "Read 'Em & Weep" shuffle akin to Lightnin' Hopkins, while the titular opener rocks like the Fabulous Thunderbirds in their hit-making ATX heyday. Then the horn-drenched "Beautiful Moments" hits a stroll-inducing, triplet-driven San Anton¬io R&B groove as if these guys listened to nothing but KONO growing up. Kathy Murray purrs like a restrained Wanda Jackson throughout, as Bill Jones oozes enough juicy guitar tones to lube a '57 Cadillac. Let's Do This Thing! is a true master class in Texas blues.